The difference, maybe, is between great art and great craftsmanship. Bergman’s exploration of the lines of love and conflict within the family of a woman dying of cancer was a film that asked important questions about faith and death, and was not afraid to admit there might not be any answers. Friedkin’s film is about a twelve-year-old girl who either is suffering from a severe neurological disorder or perhaps has been possessed by an evil spirit. Friedkin has the answers; the problem is that we doubt he believes them. We don’t necessarily believe them ourselves, but that hardly matters during the film’s two hours. 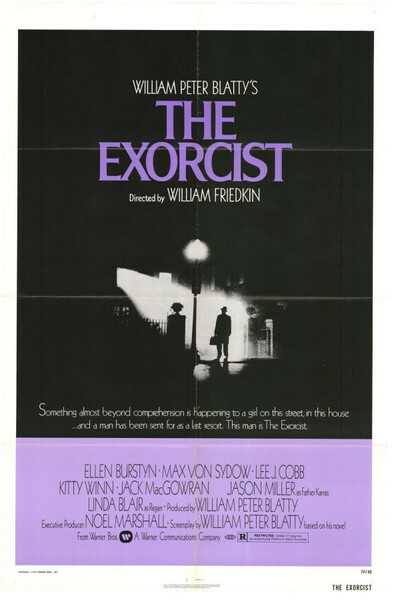 If movies are, among other things, opportunities for escapism, then “The Exorcist” is one of the most powerful ever made. Our objections, our questions, occur in an intellectual context after the movie has ended. During the movie there are no reservations, but only experiences. We feel shock, horror, nausea, fear, and some small measure of dogged hope. Rarely do movies affect us so deeply. The first time I saw “Cries and Whispers,” I found myself shrinking down in my seat, somehow trying to escape from the implications of Bergman’s story. “The Exorcist” also has that effect--but we’re not escaping from Friedkin’s implications, we’re shrinking back from the direct emotional experience he’s attacking us with. This movie doesn’t rest on the screen; it’s a frontal assault. The story is well-known; it’s adapted, more or less faithfully, by William Peter Blatty from his own bestseller. Many of the technical and theological details in his book are accurate. Most accurate of all is the reluctance of his Jesuit hero, Father Karras, to encourage the ritual of exorcism: “To do that,” he says, “I’d have to send the girl back to the sixteenth century.” Modern medicine has replaced devils with paranoia and schizophrenia, he explains. Medicine may have, but the movie hasn’t. The last chapter of the novel never totally explained in detail the final events in the tortured girl’s bedroom, but the movie’s special effects in the closing scenes leave little doubt that an actual evil spirit was in that room, and that it transferred bodies. Is this fair? I guess so; in fiction the artist has poetic license. I am not sure exactly what reasons people will have for seeing this movie; surely enjoyment won’t be one, because what we get here aren’t the delicious chills of a Vincent Price thriller, but raw and painful experience. Are people so numb they need movies of this intensity in order to feel anything at all? It’s hard to say. Even in the extremes of Friedkin’s vision there is still a feeling that this is, after all, cinematic escapism and not a confrontation with real life. There is a fine line to be drawn there, and “The Exorcist” finds it and stays a millimeter on this side.